The One World Romania International Documentary & Human Rights Festival celebrates its 10th edition in 2017. Between March 13th and March 19th around 60 documentaries, selected from over 1300 submissions, will be screened in Bucharest. In addition, all throughout the week several side events such as debates, workshops and exhibitions will take place. The whole program is now online at www.oneworld.ro. At One World Romania’s 10th edition we talk about fear and its different faces. We live in a global world, but we tend to return to the past, to draw new borders, to lock ourselves behind walls. Corrupt politicians from all over the world take advantage of our concerns and gain power by exploiting these feelings. Those who are weaker are bullied everyday by those more powerful. Some people are swimming against the tide, sacrificing all they have. 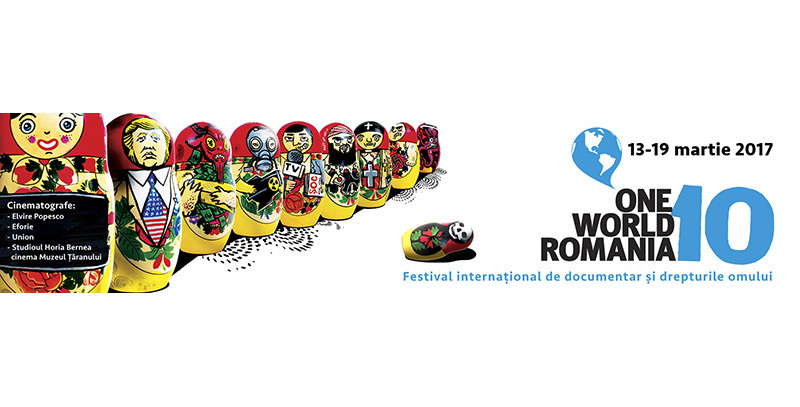 The documentaries presented in One World Romania explore the origins of our fears and how we can overcome them. The film selection at the 10th edition of One World Romania has been divided into 9 main sections, which we entitled: “Political Animals”, “Against the Tide”, “Ministry of Fear”, “Justice without Fear”, “Fear Games”, “Diseases of the Health Systems”, “Focus: the Caucasus”, “Romania on the Move” and “Delicatessen”. In addition to the main sections of the festival, One World Romania will also present 3 Romanian work-in-progress documentaries, directed by Monica Lazurean Gorgan, Radu Jude and Claudiu Mitcu. Several years ago we started the tradition of presenting each year some Romanian documentaries, which are yet to be finished, since it is so important for the completion process to get feedback, to test ideas and see how the audience reacts.